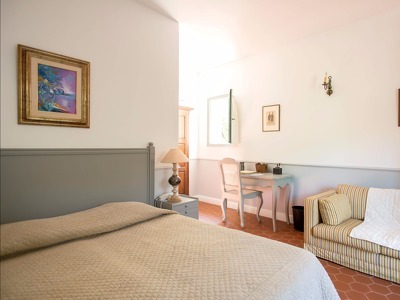 The simple, elegant rooms at Castel Brando are split between four beautiful coloured houses. La Demeure, the main residence of the hotel, dates back to 1853 and has the original thick stone walls and vaulted ceilings which are set against the ancient and traditional terracotta floors. All four houses have a Mediterranean feel, and the antiques and 19th-century decorative pieces give a real sense of Corsican history. All of the rooms are air-conditioned and come with flat screen TVs with English channels. There is disabled access in two of the rooms which have been specifically designed for easy access and mobility. 1 queen-size bed sleeping 2 people. 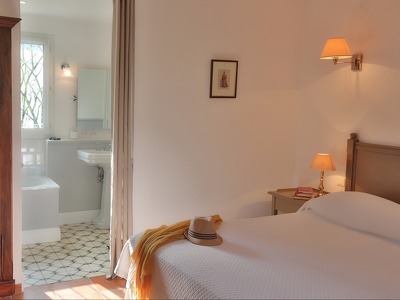 These charming rooms all have an en-suite bathroom with a shower and bath, and are decorated in warm shades. 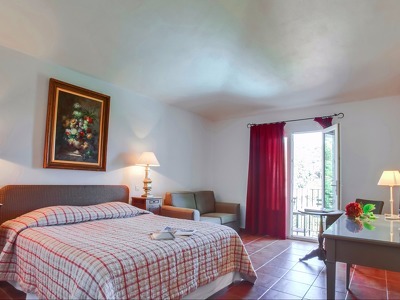 These rooms are located in La Demeure, Villa Rouge and Villa Jaune. 1 queen-size bed sleeping 2 people. 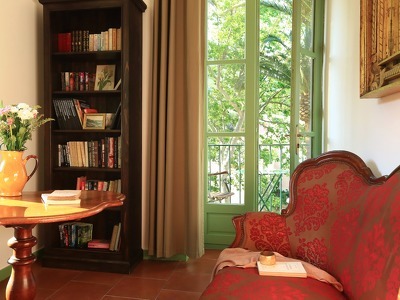 All the Superior rooms are located in Villa Orangeraie, and have their own private balcony or terrace. The en-suite bathrooms all have a bath and shower. 1 queen-size bed sleeping 2 people. With options in Villa Orangeraie and Villa Jaune, all the Privilege rooms have a private outdoor lounge, and the first floor rooms in Villa Orangeraie have views across the Brando Valley. Each room has a bath in the en-suite bathroom. 1 queen-size bed sleeping 2 people. The Privilege Suites are all located inthe main residence, La Demeure, and each has a private living room as well as a spacious bedroom. All come with a en-suite bathroom with a bath and shower. Low key, simple and charming, Castel Brando sits in the Cap Corse area of Corsica and is just 100 metres from the Mediterranean sea. This lovely hotel is in the village of Erbalunga, known as one of Corsica's most unspoilt spots and also as a hideaway for many international celebrities. A few minutes away by car is the ancient city of Bastia; with its old port, alleys and citadel, it is a nice place to enjoy a stroll. Castel Brando is the perfect starting point for visiting High-Corsica as it is only one hour from the Castagnicca region and two hours from the Balagne-Calvi & Ile Rousse region. Complimentary tennis is just 200 metres from Castel Brando and bicycles and kayaks can be hired on the beach. Sunny terraces filled with birdsong lead you to the two swimming pools, the Jacuzzi and the L'Olivier Spa. Only a few steps away is the historical village of Erbalunga itself where you can enjoy the bustling cafes, restaurants and the little harbour. To help maintain the natural environment of Corsica, Castel Brando has put into place eco-friendly measures throughout the hotel wherever possible. The delicious organic breakfast is usually served on the patio or inner courtyard next to a magnificent 100-year old olive tree and pretty antique fountain. On cooler nights head indoors to the cosy library and enjoy a glass of wine, or sit at the bar on the terrace. From June to October, a snack menu is available, celebrating local produce with delightful light bites. From the city centre of Bastia, follow signs to CAP CORSE (RD 80). Take the RD 80 road north to Erbalunga (10 km). The hotel is cleary indicated, and is in the centre of the village. 15% deposit will be taken at the time of booking. If a cancellation is made at any time, 30% of the total amount will be charged. The hotel does their best to make rooms available as early as possible; however, room check-in cannot be guaranteed before 3PM. Check-in is subject to the presentation of valid ID and Credit Card. Pets are admitted only upon request, provided their weight is under 10kgs. Owners are responsible for the behaviour of pets. Breakfast is available for an additional 15 euros. We were already in love with this place before even reaching here. This is the hotel where one of our favorite movie, Tamasha, was shot. So, we chose this place for our honeymoon stay and it was the best decision. Castel Brando has everything for everyone. There is sea just on the other side of the road, a calm swimming pool, jacuzzi, garden, restaurant, and the list goes on. The staff here is amazing. I have been to hundreds of hotel, but the staff this hotel has, tops each and every one of them. The behavior is at best, they know there English pretty well, and they are helpful like anything. This hotel, in itself, was an attraction point of our trip. This place is highly recommended. Very nice hotel with good hospitality and very tastefull breakfast!